Specializing In Instrumentation & Electrical for over 30 years! Are you having an electrical problem you can't figure out? Is your car not starting? 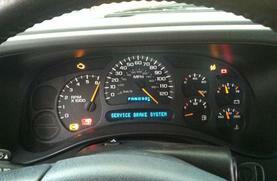 Do you have warning lights on your dash that you are not sure about? Is your speedometer or one of your other instruments acting erratic or stopped working altogether? Call us TODAY. Don't wait. We can help. For over 30 years, our experienced electricans have been resolving malfunctions just like your's. Don't take your vehicle anywhere else. Save yourself the time and the frustration by having the work done right the first time. We know electrical. With today's new "smart cars" your instrument cluster controls many aspects of your vehicle, such as the security, power door locks, air conditioning, radio and much more. CALL US TODAY. It is not always necesssary to go through the expense of a full replacement when a repair is all you need.